I get that question a lot (with the implied “why do you (and should I) care?”), and have worked to reduce my spiel down to an elevator pitch. My goal is to not just define the word, but tell why I care about entomophagy – give a convincing, but simple, explanation of why bugs are the best protein source for ethical and environmental reasons. So I didn’t quite succeed at creating a quick pitch–there are too many important points to make! I’ll keep working on cutting it down into something that closer resembles an elevator pitch, but for now, here’s my… essay, really, with statistics help from Chapul, Exo, Crik Nutrition, Bitty Foods, Big Cricket Farms, the journal Science, Stanford, and the Coursera course from Johns Hopkins on the US Food system I took a couple years ago (see here, here, and here for relevant notes). As the global need for protein continues to rise, the industrial farming system becomes less and less sustainable. Insects, specifically crickets, can be a nutritionally, ethically, and environmentally superior protein source to conventional meat. Crickets are an excellent source of protein and nutrients. They are lower in fat, and higher in iron and magnesium than beef, and are a complete protein source: they contain all nine amino acids essential to human and animal diets. The environmental footprint of a cricket farm is minuscule compared to an industrial farm system. Pound for pound, crickets produce 1% as many greenhouse gases as cows and three times less waste. 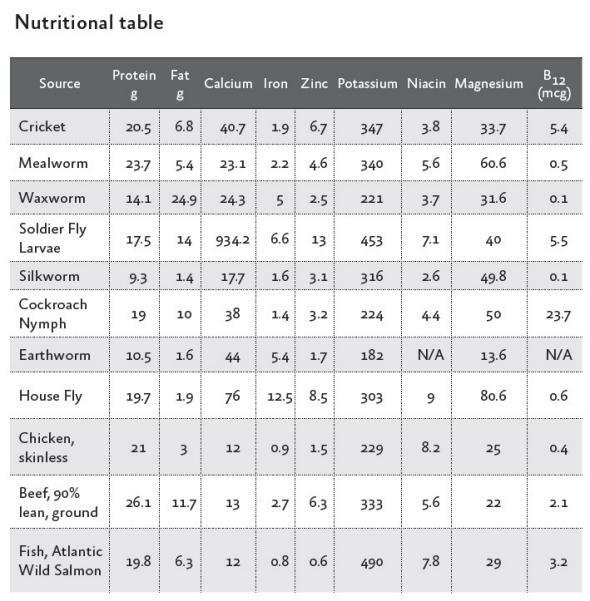 Crickets need 8% of the feed and water as cows to produce the same amount of protein, and are much more efficient as a protein source than cows: 100 lbs of feed produces 50-60 lbs of edible cricket protein, vs 5 lbs of edible beef. **** A cricket farm requires 2000x less land than a cow farm. People in poor countries need access to iron- and protein-rich meat sources, and a resilient system for growing it. Cricket farming could help solve that problem. According to the UN, if edible insects become a part of the mainstream global diet, we can reduce greenhouse gases by 18%, and lower the average cost of food globally by 33%. Other cultures all over the world eat bugs, and Americans are already eating bug parts at some levels in processed foods. Insect protein is the future, so you might as well start embracing it now! For easy entry into the world of eating bugs, try cricket energy and meal replacement bars, cricket baked goods, and cricket protein powder from Exo, Chapul, Bitty Foods, and Crik Nutrition. For 10% off Exo bars, use code HAUTEPASTURE at checkout! * Most people are aware of the terrible conditions for animals on factory farms, but the conditions can be horrible for workers too: exposure to chemicals, waste gases, particulates, hard labor, and illegals with no rights often must endure abusive hiring practices. ** Factory farms pollute water with waste storage failures and illegal dumping directly into waterways; air pollution comes from gases, particulates, and animal dander, and soil is polluted when waste is applied to land as fertilizer. For industrially produced meat products, the ratio of fossil fuel energy input to food energy produced out can be as high as 35:1, with beef produced in feedlots generally having the most unfavorable ratio. *** 7% of global water is used to grow grain for livestock, and meat production uses 70% of farmland, 30% of Earth’s surface, and 40% grain grown globally. Meat production is an inefficient use of grain, water, and land: it takes 1000 kg water to produce 1 kg of grain. The grain required to produce 100 kg of beef, pork, and poultry is 700 kg, 650 kg, and 260 kg respectively. So, for beef, it takes 7000 kg of water to make 1 kg of beef. **** Crickets require about one gallon of water per pound, about 2000x less than cows, 800x less than pigs, 500x less than chickens, 350x less than eggs, even 200x less than vegetables. ***** Usually then they’re boiled to clean them and remove wings and legs, and dried and pulverized into powder. Cricket powder alone is not very tasty, so it’s combined with other powders for cricket flour for baking, or protein powder for supplements. The wild Eastern Oyster, or Virginia Oyster, in the Chesapeake Bay is in trouble, due to pollution, over-harvesting, and loss of habitat. The population is estimated to be 2% of the historical peak; that not only hurts the local coastal economies, but impacts the Bay ecosystem. Why are oysters good for the Bay? Oysters serve two important functions in the Bay. They are little water filters, straining particulates and nutrients from up to 60 gallons of water a day. Removing particulates, such as suspended sediment and algae, clears cloudy water and aids the growth of aquatic grasses, a habitat of young fish and crabs. Nutrients like phosphorus and nitrogen from fertilizers are washed from farmland into waterways and eventually into the Bay, where they can cause algal blooms or dead zones, blocking sunlight and sucking oxygen out of the water. Secondly, oysters tend to grow in stacks, creating reef habitats for fish, crabs, grasses, and the oysters themselves: young oysters attach to the oyster shell reefs to grow and mature. Offshore reefs help buffer the shore from waves, limiting erosion, and as the shells decompose their calcium carbonate helps to regulate the pH of the water. How does recycling oyster shells help? To help revive the oyster population in the Bay, the Virginia Oyster Shell Recycling Program (VOSRP) collects shucked oyster shells from participating restaurants around the state, cleans them, seeds them with baby oysters, and returns them to oyster sanctuaries in the Bay to help build up the important reef habitats. The program was started by Virginia Commonwealth University’s Rice Rivers Center in 2013 with the help of several Richmond government and environmental groups and a few local restaurants. It’s now active in Charlottesville, Hampton, and Newport News, and is working to expand into other Virginia cities. Instead of sending oyster shells to the landfill, restaurants dump shells into VOSRP-provided buckets, which are picked up by volunteers and emptied into a central receptacle, where they await transport east. Which restaurants in Charlottesville are recycling oyster shells? Currently in Charlottesville, Rocksalt, Public Fish and Oyster House, Fossett’s at Keswick Hall, Boar’s Head Inn, and Blue Light Grill are participating in the VSORP. Patronize those restaurants to show your support for oyster shell recycling! And if you visit another local restaurant serving oysters, ask them if they know about the VSORP. The next big thing in sustainable protein: Bugs! What a lucky girl I am! Mr. HP set up a chocolate-dipped bug tasting for six at a Southwest Virginia winery. The accompanying pours were less for wine appreciation and more for steeling of nerves. The buggy treats came from My Chocolate Shoppe in downtown Charlottesville, which has created quite a buzz (get it) locally with its chocolate-dipped worms, crickets, and scorpions. The bugs are farmed and baked in California, shipped to My Chocolate Shoppe, and hand-dipped on site. As insect farming is a rising trend in sustainable and ethical protein production, I felt compelled to write about my entomophagy experience here. We all know factory farming is bad for the atmosphere, waterways, local community, resident animals, facility workers, and potentially consumers of the end product. Production of traditional livestock (chicken, pigs, and beef cattle) contributes more greenhouse gases to the atmosphere than the transportation sector and consumes vast amounts of freshwater. Factory farms pollute waterways with fertilizer, pesticides, hormones, and antibiotics. CAFOs are blights on their surroundings and poison their neighbors with chemical runoff and manure lagoon leaks. Antibiotic use in livestock is causing the development of resistant strains of bacteria that are difficult to treat in humans. See my notes from a US Food Systems course I took last year for more horrifying details and appalling statistics. As the global population continues to expand, there will be more and more pressure on the land to produce enough protein to feed everyone. Insects can fill this need with a much smaller footprint on the environment; they simply don’t require the land, water, and food resources that chickens, pigs, and cattle do. Insects produce fewer greenhouse emissions, their containers can be stacked on shelves, and insect farming doesn’t involve the hormones, antibiotics, fertilizers, and pesticides that CAFOs rely on. Are the bugs treated ethically while alive? Are they humanely slaughtered? I believe so. Farmed insects are raised in dark colonies, as they are found in nature; they are provided food, and protected. When harvesting time rolls around, they are chilled to a natural hibernation-like state, and from there the temperature is lowered until they die quietly. Bugs are a high protein, nutrient-rich, low fat and low cholesterol food. Insect protein is a complete protein, meaning all nine essential amino acids are present. Bugs are also are significant sources of zinc, iron, and vitamin A. Warning to those with a shellfish allergy: bug exoskeletons are made of chitin, which also makes the shells of shrimp, crabs, and lobsters. But how did they taste? We decided to eat the worm first, as it was the least intimidating, and we’d eat in in a single bite so we wouldn’t have to see any innards. It was… not bad. The worm had no flavor, so it just added a rice krispie-like crunch to the chocolate. Next was the scorpion, which was a similar no-flavor-big-crunch addition to the chocolate as the worm. No problem. The cricket had the biggest gross-out factor, in my opinion. Its body is meatier than the other two. And sure enough, I didn’t like it. It had a bitter flavor along with its crunch. It was a fun experiment. But – surprise – we Americans have been eating bugs all along in processed food. The FDA allows certain amounts of insect parts, including pieces, larvae, eggs, and sacs, in foods like dried herbs, canned and frozen fruits and vegetables, coffee beans, flours, peanut butter, sauces, and more. This article estimates that “on average an individual probably ingests about one to two pounds of flies, maggots and other bugs each year without even knowing it.” Sorry to break it to you, but you’re already an entomophagist! Congrats! I had no plans to eat more bugs in the immediate future, but while researching this post I enjoyed reading the Exo “Why Crickets” page so much I ordered a couple of their cricket-flour protein bars to try. I’ll let you know how it goes. I enjoyed these articles and think you might too! However, food producers are likely to feel the pinch as the world’s population climbs to nine billion by 2050, while rising incomes in large countries like China and India lead to greater demand for meat-rich diets. So entrepreneurs, researchers, and even the United Nations are looking for an animal feed less expensive than the soybeans and fishmeal typically used today. Insects like mealworms and fly larvae, a natural food for wild birds and fish, could be a near-perfect replacement. With several startups planning industrial-scale operations, it may not be long before some poultry or fish entrées are raised on a regular diet of bugs. I backed a Kickstarter campaign to help Mountain Home Farm in Vermont become an all-grass dairy farm. Consider skipping your daily latte and throwing them a few bucks! The campaign has less than a day to go! Scientists sniffing out the Western allergy epidemic: my obsession with gut bacteria continues. The bacteria that cover our skin, line our mouths and fill our guts not only outnumber our own cells by about 10 to one but may play a vital role in training our immune systems. Changes to our lifestyles are influencing these microorganisms, and allergies are the consequence. Mr. Friedberg, a former Google Inc. executive, now oversees the “precision agriculture” services Monsanto sells to farmers, a major initiative encompassing high-tech planting equipment, soil and seed analysis, and weather modeling. The lifelong vegetarian has also emerged as an unlikely champion of Monsanto at a time when the company—and the business of genetically engineering crops that it pioneered—face intensifying attacks. Any of those sound like you? Just make sure to get your extra protein from HAPPY ANIMALS! Dr. Mozaffarian said the research suggested that health authorities should pivot away from fat restrictions and encourage people to eat fewer processed foods, particularly those with refined carbohydrates. Remember that the food you eat is feeding your gut biome. Take care of it! Coursera is an online educational platform that partners with colleges and universities around the world to offer free courses across a wide variety of topics. I’ve taken a few classes and enjoyed them all: the lectures, quizzes, and projects have been well designed, and it’s obvious a lot of work has been put into them; and the flexibility of the weekly assignments makes it easy to fit the coursework into my schedule. I highly recommend checking out the list of courses being offered if online learning is your cup of tea. Below are details about an upcoming course I am super excited about, and two others I have taken in the past that are relevant to Haute Pasture. The human body harbors up to ten times as many microbial cells as human cells. What are these microbes and what are they doing? How can we study them to find out? What do they tell us about ourselves? Just as our human genome records traces of who we are and the conditions we have adapted to during evolutionary history, our microbial genomes may record traces of what we have eaten, where we have lived, and who we have been in contact with. The microbial ecosystems in different parts of our bodies, which differ radically from one another, also supply a wide range of functions that affect many aspects of human health. Join us on a guided tour of the human gut and its microscopic inhabitants. We will first review what microbes are and how they get into our bodies. We will then discuss the methods we use to study microbial communities and briefly explore how gut microbiome data are analyzed. This information will provide us with a foundation to explore current microbiome research. We will cover topics such as the influence of the gut microbiota on our nutrition, health and behavior. Did you know that gut microbes may influence how sick we get or the way we feel? The course will culminate with an in-depth review of the American Gut Project, the world’s largest open-source, crowd-sourced science project, from how it works to what it’s taught us up until now. This course starts October 6th and it should be fascinating! The Meat We Eat is a course designed to create a more informed consumer about the quality, safety, healthfulness and sustainability of muscle foods and address current issues in animal agriculture in developed and developing countries. Lectures will cover all aspects of muscle foods production, processing, preparation, cooking and storage. Additionally, the role of muscle foods in a balanced diet will be addressed as will issues which contribute to consumers limiting or eliminating meat from their diets. I took this course in the summer of 2014. The final project for the course was a multimedia presentation on meat cookery; mine is here. A food system encompasses the activities, people and resources involved in getting food from field to plate. Along the way, it intersects with aspects of public health, equity and the environment. In this course, we will provide a brief introduction to the U.S. food system and how food production practices and what we choose to eat impacts the world in which we live. Through several case studies, we will discuss some key historical and political factors that have helped shape the current food system and consider alternative approaches from farm to fork. The course will be led by a team of faculty and staff from the Johns Hopkins Center for a Livable Future. Guest lecturers will include experts from a variety of disciplines, including public health and agriculture. A quick comparison of the trendy quick-fix diet/fitness products–what works and what doesn’t. “The scientists say the threat to nature is the same as that once posed by the notorious chemical DDT.” Neonicotinoids could be poisoning bees, and aquatic invertebrates, which are the basis of many food chains. Their use in a prophylactic way is compared to antibiotics abuse in farm animals. Everyone loves a guest post from Cheenius! Thanks, Cheenius! With a name like Cheenius, you’d expect someone who really knows cheese. But frankly, Cheenius has been more of a cheese dabbler than anything else. Sad. So, you can imagine her excitement when she sourced some local goat milk and decided to hold her very first CHEESE DAY! First, somewhat sleep-deprived from the anticipation that accompanies Cheese Day Eve, Cheenius got up early to pick up the goat milk. The friendly goat owner provided Cheenius with not only a gallon of fresh milk, but some chevre and extra milk for tasting. Cheenius even got to meet Lavender, the goat who provided the milk! After Cheenius gathered her mostly-willing Dad, Aunt, and Uncle, goat milk shooters were downed and the work began. We assembled the ingredients, and then discussed our battle plan: One Day. Two Cheeses. We wanted to attempt a simple paneer and then if we weren’t demoralized and/or cranky, move up to a slightly more advanced feta. For the paneer we basically just heated up the goat milk, added lemon juice, let the curds and whey separate, salted, and then squished it for awhile, and voila! Very-bland-but-edible cheese!! Paneer-fortified, and feeling pretty darn confident, we were now ready for feta. We went with Tinkling Springs whole cow’s milk for this attempt, and then hit some tedium: a lot of chemistry, heated discussions about the best way to maintain a temperature of 88 degrees, and then long periods of just waiting. Luckily, we filled the waiting periods with games of pool or Bananagrams, so no time was actually wasted. We did realize that we should have started the feta earlier, since to stick with the recipe Cheenius had to stay up late to salt the feta at the right time. We were also a little disappointed that for all that work we only got 4 turds of feta (only 2 shown; Cheenius is not an idiot, she know how to count turds). The next day we bounced out of bed to try the perfectly salted feta, and it tasted like . . . FETA! Evidently our 5 degree temperature swings (yeah, whoever won that argument about temp control didn’t actually “win”) weren’t enough to upset this very forgiving cheese. Cheenius plans to try freezing some to see if she can make bigger batches in the future and get more turds for the same amount of work. The unexpected bonus to the experience was that two Cheese Day byproducts, the whey and the extra goat milk, were made into Whey Bread and yogurt. Yum! One last thought to leave you with, as HP always says: Remember, you’ve got a friend in cheeses! Recently I attended Transition Charlottesville‘s butter churning skillshare, where Cheenius and Butter Boy taught me that it is possible to make butter by pouring cream into a jar and shaking it. Magical! But it gets better! They next said you can put the cream jar into a backpack and take it for a hike and it will slosh itself into butter! I immediately thought of horseback riding as an potential jar agitator, and over the weekend I conducted a little experiment. I am happy to report that it was a delicious success! Read on for the details of my science project (please imagine you are viewing a science fair display board) and to learn how you, too, can churn butter on horseback. Is it possible to shake a jar of cream into butter during a session of horseback riding? If I put jars of cream into a pack on my back and ride my horse, then at the end of the session I will have jars of butter. 1. Let the cream sit on the counter for a couple hours to come to room temperature. Fill the jar(s) about halfway with cream. 2. Put the jars in a backpack. I used a lumbar pack and started with the jars in the main pocket, moving them later to the water bottle holders to keep them from knocking together. 3. Ride your horse. Do not fall off your horse with jars on your back. Do not freak out your horse with the strange jar noises coming from an unknown (to horse) location. 4. Halfway through your ride, check the jars. You should see a thick sludge of whipped cream. If you have to remove your pack in the middle of your ride because your horse didn’t appreciate the clatter and threatened to unload you, you may have to do some shaking by hand afterward to reach the solid butter stage. 5. Once you have a solid ball of butter sloshing in buttermilk, scoop the butter into a bowl and rinse it a few times, mashing it around to get all the buttermilk out. Buttermilk left in the butter will mold and turn the butter rancid quickly. I noticed when we started trotting that the jars were a bit noisy, and my horse was acting up a little. My horse is normally sassy, so it’s hard to say if she was reacting to the scary sounds or just being her usual self, but when we started doing more serious work I decided to take the pack off to avoid upsetting her. After about 20 minutes of bouncy riding, the jar contents were a heavy sludge of whipped cream and a friend (hi Josh!) and I finished shaking the jars by hand after we rode. It took less than 5 minutes of shaking to get to the butter stage. I did not expect the jars to make so much noise in the pack (even when separated) and next time will wrap them in cloth to muffle the sounds to spare my poor, sensitive princess pony. While horseback butter churning may take longer than shaking a jar by hand, it requires less effort. Next time I will give the cream more time to completely warm to room temperature before beginning, to shorten the time required to reach the butter stage, as warmer molecules move faster than cooler molecules. I could also try adding an agitator like a marble or wine cork to the jar to speed up the process. The type of riding, and the intensity of your session, will affect the time required to reach the butter stage: mellower types of riding, like Western pleasure, where there’s no posting and gaits are smooth, or trail riding at slow speeds, are less bouncy than typical English hunter/jumper riding; and a casual stroll will agitate the cream less than a vigorous training session. Is it possible to sufficiently shake a jar of cream into butter during a session of horseback riding? Yes! While my jars didn’t quite reach butter stage before I removed my pack, I am confident that they would have if I had kept the pack on until the end of my riding session, based on the short length of hand-shaking time required to finish the butter. The reason this works is because heavy cream is an emulsion of fat and water, and the shaking causes the fat molecules to stick to each other, building up clumps of butter. See a better science-y explanation here. Two (half) jars of cream turns into A LOT of butter. Bring more bread next time. People at your barn will think you are strange if you attempt this. On Monday night, our daring dairy divas Cheenius and Butter Boy, after honing their churning technique at home, presented their butter knowledge to an eager group at a crowded Transition Charlottesville Skill Share session. The presentation was fantastic, complete with expert commentary, audience participation, butter trivia and jokes (we learned there are no funny butter jokes), and buttermilk shooters. We tasted the final product on tasty Great Harvest bread and those of us who paid attention to the email and brought containers (thank you for your spare, Rachel!) took home some of the freshly churned gold. Your intrepid reporter’s favorite aspect of the evening was learning about making butter in a jar: pour in some cream, shake it for about 25 minutes — OR throw the jar in a backpack and go for a hike, ride a horse, mountain bike, etc etc etc — and boom, you have butter. Look for a Haute Pasture Research Experiment Report on that soon. Thank you Cheenius and Butter Boy for a delicious evening!